The Gympie Railway Station, a large railway complex bounded by Chapple, Mellor and Tozer Streets, is located on Caledonian Hill to the northeast of the central business district of Gympie. The complex comprises a long island platform which links via a subway, underpass and overbridge to neighbouring streets to the south and by parallel railway lines to engine yards and the remainder of the larger railway complex to the north. The island platform accommodates a substantial station building, a guard's room and storage room all built in the Pagoda idiom favoured by Queensland Railways at the time. The main station building is a long narrow, one and two-storey, timber-framed structure running the length of the raised concrete island platform. Its varying roof forms are a dominant feature with raised lanterns piercing the roof lines. Generous platform awnings extend from each side of the building shading to the platform edge. The roofs are clad in rib and pan metal sheeting and external walls are clad in chamferboard. The centrally located two storey section accommodates the main entrance at the platform level. The single storey portions extend either side and cantilevered platform awnings run along their lengths shading the platform. Roofs to the lower level are truncated hips and a gambrel roof shelters the upper level. The main entrance to the station faces Tozer Street and provides access to the ticket booth and waiting area. The entrance is framed by a decorative archway with short timber balusters. Curved glazed fanlights are located above the two timber panelled entrance doors and above casement windows with coloured glass panes. Wall cladding below the window sills in this area is formed from vertically fixed v-jointed boarding. The unlined timber framed platform awnings clad with metal sheeting are notable for the large, decorative riveted iron brackets running the length of the station building sheltering the platform edges. Windows on the upper level are double-hung and top sashes have a multi-paned detail of coloured glass. These windows are shaded by timber-framed awnings with decorative timber brackets. Openings on the lower level include double-hung windows with a similar multi-paned coloured glass to those to the upper level and timber-framed panelled doors with glazed fanlights. Bay windows with double-hung sashes project towards the platforms on each elevation to the south of the main entrance. Openings are framed with decorative timber architraves. The roof lantern vents are located along the length of the building and include two to the northern end, one to the southern end and one on the upper level roof. Light and ventilation are provided through timber slatted openings. Gutters to the platform awning are quad-profile while gable rolls and gutters to the main roofs are recent square profile metal. The short southern elevation features gable ends finished with a decorative slatted barge board and exposed ceiling joists. A small multi-paned ticket window is the only opening. The northern elevation of the main building is obscured by the c.1924 refreshment room addition but similar gable details to the south elevation are visible above the roof of the addition. The c.1924 addition has a lower pitched roof and shorter timber-framed platform awnings. Walls to the addition are clad in weatherboard and windows are simple double-hung sashes protected by timber-framed window hoods. On the western side of the addition a recent timber-framed covered walkway has been erected which links the station building to the guard's building. The interior of the station building is centred on the main waiting area. To the south of this area is the current ticket sales area (the former ladies' rest room), former station master's office, and former booking office. To the north of the waiting area is a souvenir shop (the former servery), a refreshment room (reconfigured) and a former bar room and yards area now housing a model train display. On the upper floor a large open room (the former kitchen, scullery and pantry) is now used as training/office area. The interior of the lantern vent is visible in this room. Internal walls and ceilings are lined with v-jointed boards with simple timber cornices, architraves and other mouldings. Internal doors which remain are panelled glazed doors with coloured panes similar to those in the external openings. Floors are lined with recent linoleum. A solid timber counter faces the waiting area from the ticket sales area. A staircase to the east of the ticket sales area accesses the upper floor which has similar finishes and detailing to the lower floor. Distinctive elements of the station building and platform include a metal drinking fountain, timber and wrought iron platform seating, early signage, an early telephone located in the former servery area, remnant gas fittings in the store room end of the building and a fold up washbasin behind the bar in the refreshment room. The guard's building, a timber-framed structure with a gable roof, accommodates male and female toilets and storage areas. Walls are clad with chamferboard while the roof is clad with corrugated metal sheeting. Timber-framed louvred vents are located at the wall and ceiling junction on the western and eastern elevations. Gutters are formed from quad-profile metal and gable ends feature metal gable rolls. The recent covered walkway extends from the station building to form a platform awning on the western-side of the guard's building. Panelled doors with fanlights above are located on both platform-facing elevations while double-hung windows are located on the northern and southern elevations. All openings are framed with decorative architraves and architrave blocks. Internal partitions and ceilings are lined with v-jointed boards. A store building is located next to the guard's building and is a simple timber-framed structure with a gabled roof. Walls are clad with chamferboard while the roof is clad with corrugated metal sheeting. Gutters are quad profile metal and gable ends feature metal gable rolls. Windows are simple double-hung sashes and large, ledged doors open out to the western platform. A small metal window hood shelters the doors. The signal maintainer's hut, located at the northern end of the platform, is a small timber-framed structure sheltered by a gabled roof with overhanging eaves. Walls are clad with chamferboard and the roof is clad with corrugated metal sheeting. Gutters are quad profile metal and gable ends feature metal gable rolls. Sets of multi-paned windows are located on platform facing elevations. A covered waiting area links the main station building to the goods lift and subway to the south. The structure's flat, cantilevered roof is supported by substantial bracketed timber posts. The roof is clad with rib and pan sheeting. A concrete-walled subway provides pedestrian access from the southern end of the platform to the station entrance off Station Road below. It is accessed through wrought iron gates which open to concrete-formed steps leading down from the platform. The opening in the platform is bound by wrought iron spear-topped balusters and is sheltered by a roof formed from curved, corrugated metal sheeting supported on a timber frame. A sign with lettering 'WAY OUT' is located at the entrance to the steps. At the base of the steps the platform above is supported on a concrete-formed arched lintel. The walls of the subway are formed from concrete which has recently been painted with decorative murals. Access to Station Road is through another set of wrought iron gates. A 1963 ticket and parcel office is located on Station Road and is not considered to be of cultural heritage significance. Concrete formed steps parallel to the railway lines rise to a now demolished footbridge which passed over the Station Road underpass. Walls supporting the steps are formed from heavy concrete walls, piers and plinths and are capped with concrete sills. Two half-through steel plate girder bridges supported on concrete abutments carry the rails over the underpass. A scallop-edged wall leads to another smaller set of concrete steps which lead directly into the road underpass. A luggage lift is located behind the subway access steps at the southern end of the station platform. It is sheltered by a simple gabled roof. The goods lift is framed with sheet metal and accessed into the lift is at the rear by a small sliding door. Early signage is visible at the rear of the lift. A large timber overbridge is located at the far southern end of the station building with steps leading from the island platform to a bridge over the railway tracks and with steps at each end alighting onto Lady Mary Terrace to the west and the grounds of the Railway Hotel to the east. This structure is framed in timber and is supported on braced timber posts supported on concrete plinths. Balustrades are formed with timber posts and horizontal rails. Directly over the railway line, timber smoke screens are attached to the underside of the bridge. The Gympie Railway Station platform complex is an intact component of a much larger former railway complex. Built on a site operating as a railway station from 1881, the platform complex largely dates from the 1910s and includes the station building and adjacent structures, pedestrian subway and luggage lift, underpass, footbridge and overbridge. The complex was built in response to changing requirements associated with the expansion of Queensland railway network and reflects the important status of Gympie within this system. Gympie (initially called Nashville) was established after the discovery of gold in October 1867 by James Nash in the Upper Mary River district. The new gold field put Queensland on the map as a significant gold producer, contributing much needed finances to the young colony. By Christmas of 1867, according to the Gold Commissioner, the Gympie field had a population of 4,000 (or over 15,000 according to James Nash). Although the alluvial deposits were quickly exhausted, from 1868 shallow reef mining occurred. The early makeshift structures of Gympie gradually gave way to more permanent and substantial public and private buildings. Within months of the establishment of the goldfield, the idea of a railway linking Gympie to a port had been raised and various proposals for a starting point including Maryborough, Brisbane and Tewantin were promoted. Ultimately, the campaign for a Maryborough-Gympie route was successful. By the end of the 1870s, an intensive phase of underground reef mining was underway, facilitated by the injection of share-holding capital into mining companies for machinery and employees. Gold exports made up 20% of Queensland's economic output by 1870, outperforming wool in 1875. The increasing influence of the mining industry, and its ability to compete with other interests jostling for a rail link was evident with the Queensland government's approval in August 1877 of three railways connecting mining towns to their principal ports: Townsville to Charters Towers; Bundaberg to Mt Perry; and Maryborough to Gympie. The Maryborough-Gympie line was the first in the colony to run in a north-south direction rather than westwards from a port; the beginning of Queensland's coastal route. Originally a terminus was planned for Commissioner's Hill, where most of Gympie's government buildings were clustered, but in 1880 a more central site on Caledonian Hill was approved. The railway to Gympie opened in August 1881 and soon became the dominant transport artery for the movement of goods and people in and out of Gympie. 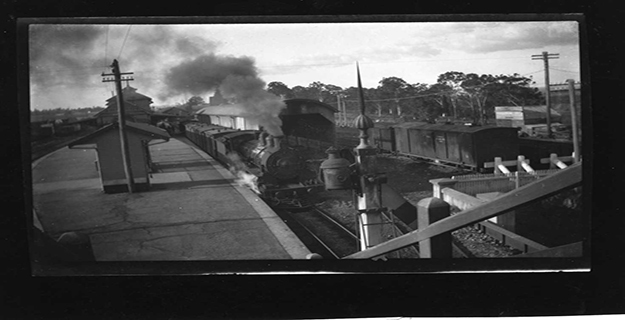 Within three months of opening, the traffic between Gympie and Maryborough required two trains daily. Timber extracted from the abundant softwood and hardwood stands surrounding Gympie was the main product to be transported for many years. 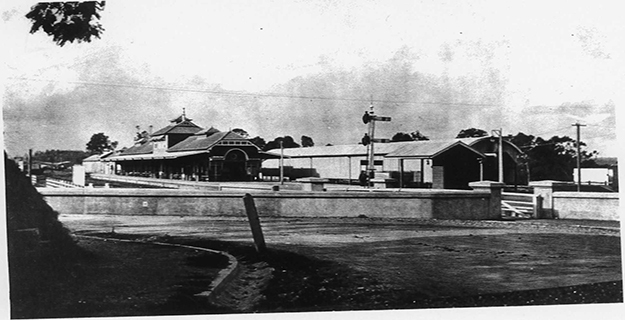 The station buildings at Gympie and Maryborough were positioned at the terminus of the track line, marking the railway's dead end status. Within a year of the line opening Gympie representatives had begun lobbying for a rail link to Brisbane. 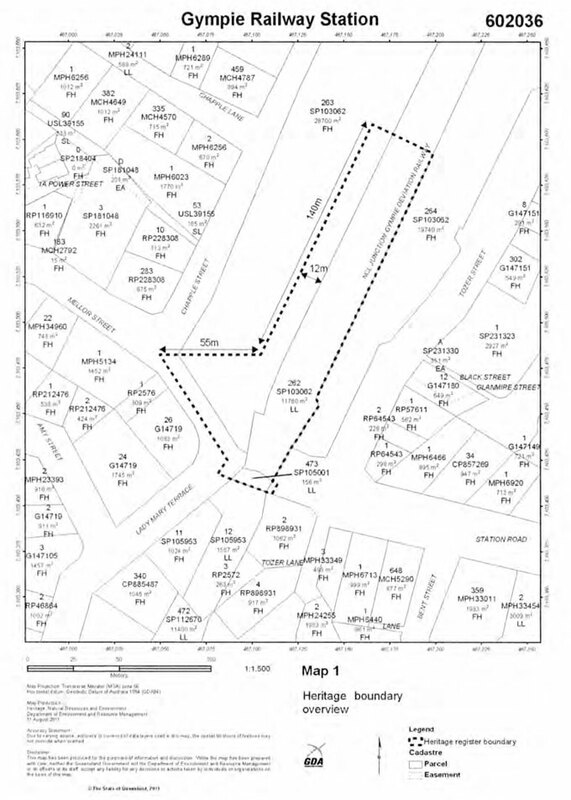 Brisbane commercial interests also pushed for better access to the Gympie market. A route was surveyed in 1885 and by 1886 the first section of the North Coast line from Brisbane-Caboolture had commenced construction. In 1888 construction of the remaining sections commenced simultaneously from Caboolture and Gympie. The Gympie-Brisbane line was opened in mid-1891, linking a route extending from Brisbane to Bundaberg. To enable the extension to proceed, Gympie's station building was moved from the end of the track and re-sited within the yard on the southern side of the line. The passing of the North Coast Railway Act in 1910 facilitated the linking of the separate regional divisions of Queensland Railways into one network, through extending the state's coastal route. The passing of the Act (together with the Great Western Railway Act 1910) provided a major impetus for increased spending and construction works on the Queensland railways. 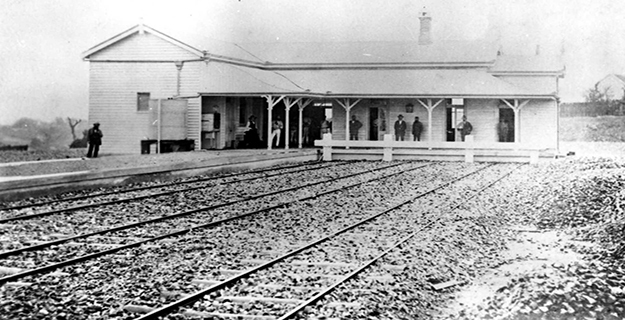 New stations were built along the main lines in places such as Brisbane, Gympie and Townsville between 1910 and 1917. A corresponding development of improved locomotive technology, rolling stock, and railway infrastructure in general characterised this period, along with the construction of new rural branch lines throughout Queensland. 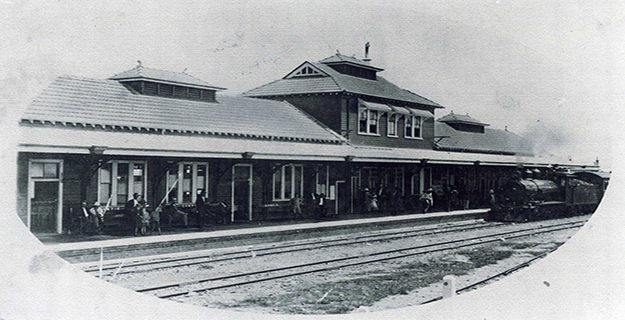 Major improvements and additions were undertaken at the Gympie station from 1911 to 1915. A triple-gabled, open-ended engine shed was built in 1912. In the same year plans were drawn for a substantial new passenger station building, designed within the architectural section of the Railway Department's Chief Engineers Office. Vincent Price was in charge of the architectural section at this time. The station was based on the Queensland Railways A series 'Pagoda' standard design. 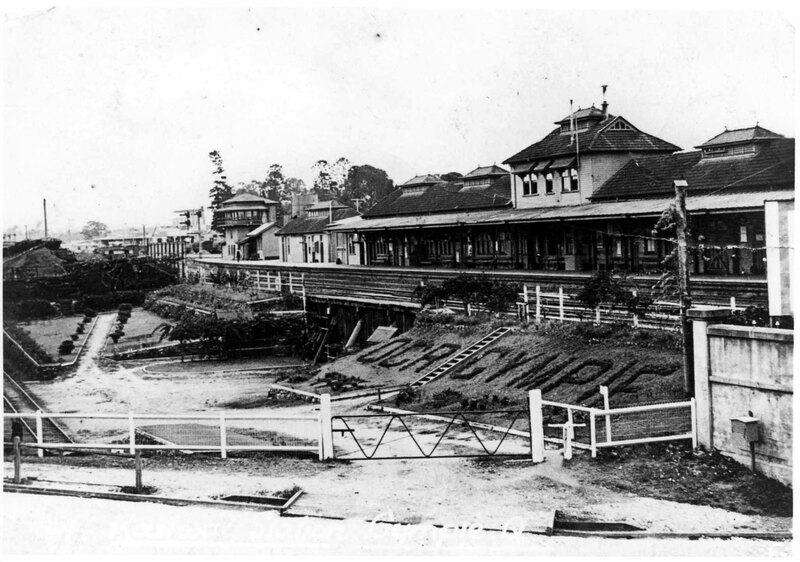 From the 1860s, Queensland railway stations were predominantly built in timber, with only a small number of masonry stations built in major urban centres like Brisbane and Toowoomba. The Pagoda design series saw Queensland Railways adapt stylistic elements of what is often described as 'Federation style' to its existing timber tradition. Federation style architecture, broadly dating from the 1890s to 1915, incorporated a wide range of stylistic influences including the Queen Anne, English Arts and Crafts movement, Art Nouveau and the American shingle styles.Distinctive characteristics employed at Gympie included the use of decorative timber detailing, windows with small upper panes of coloured glass, ornate platform brackets, and Marseilles tiles on a picturesque roof form featuring half hipped ends, projecting gables and lantern vents. Other passenger stations built in 1913 in the 'Pagoda' style included the much smaller Yarraman (since relocated), Dirranbandi and Home Hill stations. Gympie's station appears to be the largest timber passenger station built by Queensland Railways during the twentieth century. Construction of the station commenced in early 1913, with the new building commencing operations from 1 December. Positioned on an island platform, the long narrow chamferboard-clad building housed a bar, refreshment room and servery, waiting room, ladies room, station master's office, telegraph and booking office and sheltered ticket sales area. A smaller upper floor housed the kitchen, scullery and pantry for the refreshment room, serviced by a hand operated lift, and a concrete underground cellar was provided behind the bar. Cantilevered platform awnings with decorative riveted iron brackets extended the length of the building on both sides, from which lamps were suspended for lighting. Upon its completion, the Gympie Times described the station as '...certainly the most attractive of government buildings in Gympie...which lends distinction to its surroundings'. Next to the station on its north end, a smaller timber building following the Pagoda design style housing a lamp room, porter room, guard's room and toilets was completed around this time. Other major work included the construction of a subway and luggage lift to provide pedestrian access from the southern end of the island platform to the station entrance, and an adjacent underpass to replace a gated crossing between Station Road and Mellor Street. Large excavations were required for this undertaking, and concrete walls were built to line the underpass and the station entrance. A set of concrete steps between the entrance and underpass linked to a small timber footbridge running parallel with the railway, connecting to Lady Mary Terrace. Two half-through plate girder bridges were constructed to carry the rails over the underpass. In 1915, a large timber two-span overbridge with steps leading from the island platform and steps alighting onto Lady Mary Terrace and Station Road was also completed. Timber screens were attached below the bridge to reduce pedestrian exposure to train smoke. The Gympie goldfield passed through its most profitable period from 1901 to 1906 and in 1903 produced its peak annual output. After 1906 production declined and by 1925 the last of the big mines had ceased operations, ending a 50 year phase of deep reef mining in Gympie. By this time dairying and agriculture (especially fruit production) had emerged as key contributors to the economy of the Gympie district, strongly influenced by the opening of the Mary Valley branch railway in 1915 and the resulting influx of new settlers. These industries were heavily reliant on transport by rail and increasingly informed activities within the station complex while shaping the development of the surrounding precinct. The Wide Bay Co-operative Dairy Company was located on Tozer Street from 1906 and in 1925 built one of Australia's largest butter factories, a reflection of the region's prominence in dairying. In 1937 the Petty Sessions District of Gympie was Queensland's largest milk and butter producer, with the greatest number of dairy cattle in milk. The Gympie district was the largest producer of bananas in Australia in the 1920s and from the 1930s an important pineapple and bean growing area. 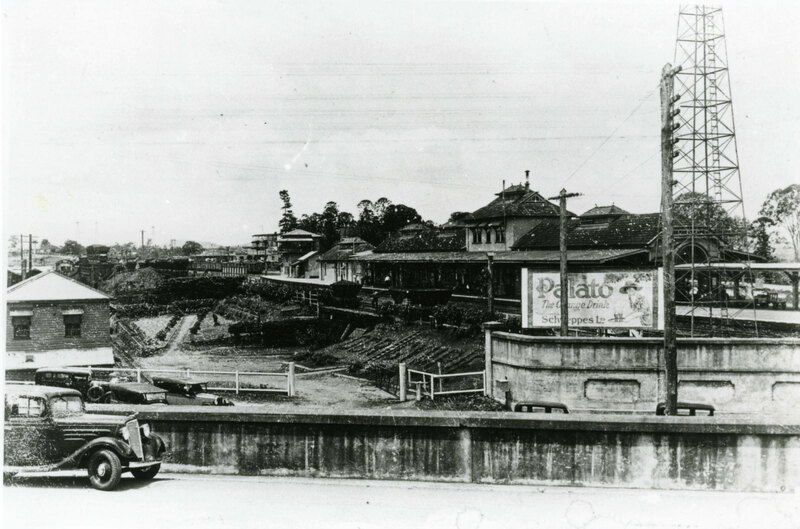 Fruit trains began operating from Gympie to Melbourne from 1923 and in 1929 the Gympie Fruit Growers Co-operative Association erected premises opposite the station on Tozer Street. The opening of the Townsville-Cairns section of the North Coast line in December 1924, the final link of Queensland's coastal route, sent more goods and people through Gympie. 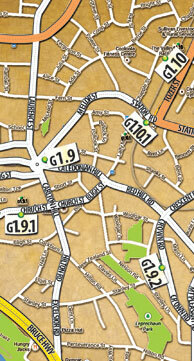 This increase in traffic determined further substantial alterations to the complex in the second half of the 1920s. Plans were drawn for an extension of the refreshment rooms in 1924, the northern end platform was extended in 1927 and the subway lift shaft at the south end was altered for a new electric lift. Other work included the installation of an electropnuematic signalling and interlocking system and triple storey signal cabin, addition of more rail lines within the complex, a new turntable and coal chutes. A 1932 site plan shows the platform shade extending from the south end of the station building to the subway entrance had been built and the earlier single storey signal cabin at the north end of the platform was in use as the signal maintainer's 'hut'. By the 1930s, the Gympie railway station complex had evolved into one of Queensland's most substantial and busy railway complexes. Extending beyond the main yard into adjacent streets, a range of structures existed to meet the needs of railway staff and customers. Such structures included engine and wagon repair shops, storage and maintenance sheds, loading banks and trucking yards, offices, union rooms, station masters residence and guards, loco, inspectors and waitresses quarters. Within the yard were some 11 miles (17.6 km) of railway line. The station played an important role in moving goods and people throughout most of the twentieth century. Gympie was the terminus for passenger services from Brisbane and Maryborough and the administrative boundary between these railway districts and operated as a crew change point, train examination, shunting and re-marshalling centre. During WWII, Gympie became an important depot and meal stop for troop trains. After the war the local small crops industry continued its expansion and in 1955 agricultural loadings worth a total of £1,494 000 were sent from the Gympie station including 900,000 cases of pineapples, 85,000 cases of beans and 20,000 cases of bananas. Over time, a range of factors including the transition to diesel from steam, competition with road transport and changes in rural industries impacted on the operations of the station and informed changes to the complex. By 1956 a small timber building had been built next to the signallers hut on the platform and was used as a porter's room. The sheltered ticket sales at the south end of the station building area had been enclosed for other purposes and the north end was also extended for storage. In 1963 a new ticket and parcel office was built within the former parking area adjoining the subway entrance. During the 1970s, the roof tiles on the station building were replaced by metal sheeting. By 1980 the roofing on the guard's room had also been clad with metal sheeting, the lantern vent removed and the half-hipped head roof ends of the building replaced with gables. The platform was further extended to accommodate longer air-conditioned trains. The three storey signal cabin was made obsolete around 1980 with the introduction of CTC signalling and was removed circa 1989. In 1970 the 24 hour refreshment rooms dispensed with evening trading, before the service stopped altogether in 1972. In the 1930s, the rooms had employed two cooks, a manager and 15 waitresses. The closure of the refreshment rooms and other operational needs saw the internal spaces of the station building used for other purposes. In 1981 the main station building accommodated spaces for records and other storage, porters, fitters and driver's rooms, loco crew amenities, inspector's office, switchboard and CTC control room. The former kitchen on the first floor at this time housed the station master's office. The porter's room on the platform was in use as an electrician's hut. The Gympie station had been operating for a century by 1981 but by the end of the 1980s was rendered largely redundant. As part of the upgrading and electrification process of the North Coast line between Brisbane and Rockhampton, an eastern deviation was constructed by Queensland Rail. A new station 'Gympie North' was built as part of this project, opening in early 1989 with the inauguration of electric train services. Gympie Railway Station was relegated to a goods and freight depot from 1989 before officially closing as a Queensland Rail station in 1995. By this time many of the structures within the complex had been removed. 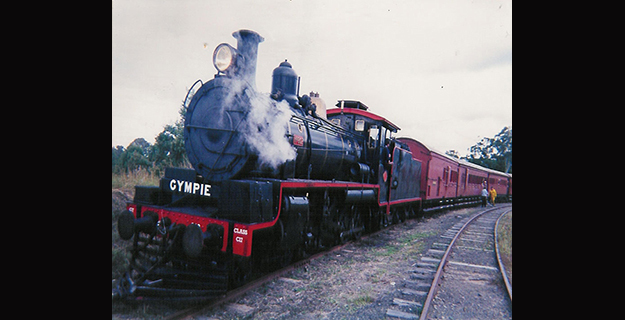 For over a century the station complex was intrinsically linked to the economy of Gympie and the surrounding area and played an important regional role in Queensland's rail network. 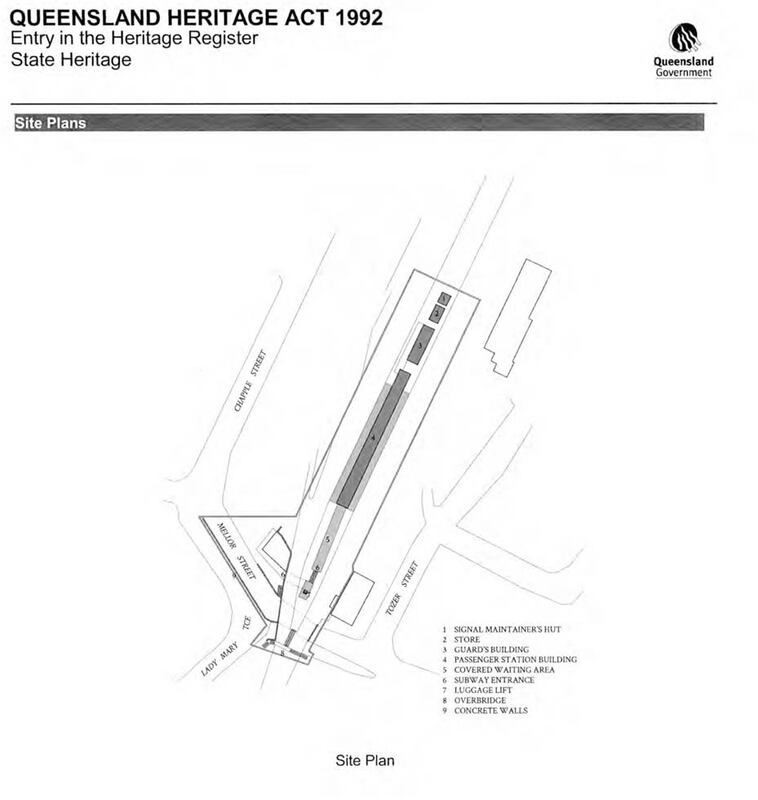 While facilitating the movement of goods, the site was also an important social space, for the wider community who greeted and farewelled family, friends and distinguished visitors at the station, for rail travellers passing through, and for the many employees connected to the station. The closure of the station occurred in the same year goods trains ceased operating on the Mary Valley branch railway following its gradual decline in previous decades. The line however, was not formally closed and in 1996 the Mary Valley Heritage Railway Board negotiated to conduct tourist steam train services on the line and in 1997 became the custodians of much of the Gympie Railway complex. The Mary Valley Heritage Railway commenced operations on the former Mary Valley branch line on 23 May 1998. The 'Valley Rattler' steam train tours and rail motor rides have since become a major tourist attraction for the region. A large group of volunteers and trainees contribute to the operation and maintenance of the line, rolling stock and buildings between Gympie and Imbil. Gympie Railway Station Platform Complexis a place that satisfies one or more of the criteria specified in s.35(1) of the Queensland Heritage Act 1992 as evidenced by, but not exclusive to, the following statement of cultural heritage significance, based on criteria A, B, D and E.
The Gympie Railway Station platform complex is important in demonstrating the expansion of Queensland's railway network and the growth of Gympie as a major regional centre. As a key site for the movement of goods and people for over a century, the station was intimately connected to the Gympie district's development of its mining, timber, dairying and agricultural industries. 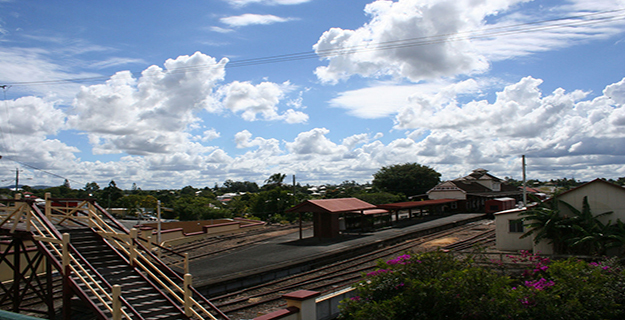 First established in 1881 as the terminus of the line from Maryborough, the station evolved over time following connections to Brisbane in 1891, the Mary Valley branch railway in 1915, and the extension of Queensland's coastal railway route. 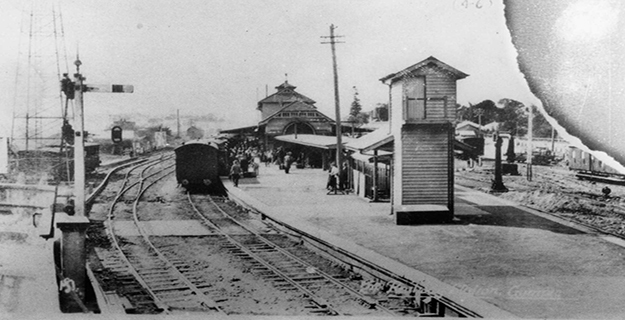 Major improvements dating from 1910s including the island platform, station building and associated pedestrian infrastructure demonstrate the response to changing requirements associated with the expansion of Queensland railway network and the important status of Gympie within this system. Later additions, including the platform shade, platform extensions, electric luggage lift and additional platform buildings further illustrate this growth. The highly intact passenger station building (1913) is important as an example of a large station building derived from the Queensland Railways A series 'Pagoda' style standard design and is considered rare in Queensland, as is the luggage lift (1927) connecting the platform and subway. The intact arrangement of structures within the platform complex is rare within a Queensland railway station setting and includes the station building and adjacent staff and storage structures, pedestrian subway and luggage lift, underpass and overbridge. 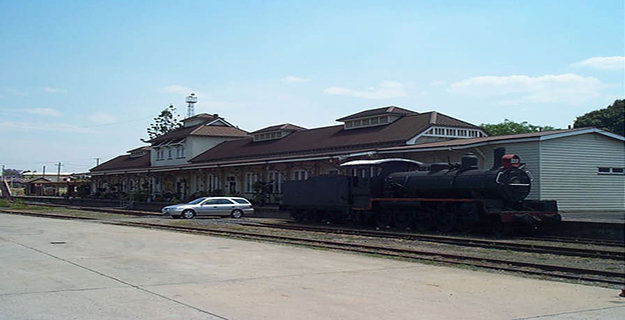 The passenger station building is important in illustrating the principal characteristics of a major regional railway station of the early twentieth century. These characteristics are expressed by the highly intact building in its platform setting, substantial and imposing form, exterior detail, internal layout of offices, storage spaces, refreshment and waiting rooms, and associated fittings, fixtures and decorative detailing. The station building's shaded platforms and waiting areas, its generous eave overhangs and window awnings are distinctive elements of early twentieth century railway architecture in Queensland. The passenger station building is important in demonstrating the evolution of passenger station design in Queensland during the early twentieth century. Derived from the A series 'Pagoda' style standard design, distinctive features including the ornamental platform brackets, coloured glass windows, decorative timber detailing and roof form demonstrate the adoption of Federation style architectural characteristics by Queensland Railways during the 1910s. Adjacent ancillary buildings used for staff and storage purposes are important in contributing to an understanding of how the station functioned. The platform shade, subway and luggage lift, underpass, and overhead bridge illustrate the response to the requirements of passengers and pedestrians. The landmark qualities of the Gympie passenger station building, derived from its elevated location and substantial form, reinforce its status as an important part of Queensland's regional transport network and declare Gympie's regional standing. Its prominence combine with its distinctive design features, including the ornamental platform brackets, coloured glass windows, decorative timber detailing and roof form to make a strong contribution to the Gympie townscape. The cohesive arrangement of buildings and structures within the complex, its aesthetic qualities and distinctive spine-like arrangement evoking the shape of the hilltop on which it stands, can be appreciated from a number of vantage points within and beyond the complex, including the Railway Hotel [QHR 602540] and adjacent streets. Gympie Region Heritage Trail website is packed full of interesting details about the Gympie, Mary Valley, Cooloola Coast, Goomeri & Kilkivan. Take a journey back in time and explore the Gympie Region rich history which included gold mining, dairy, beef, timber, farming, rail & many more iconic attractions and events that shaped the region into what it is today!